Week 15th-19th April fully booked . 23rd-26th April I am away on annual leave. If you've attended my antenatal class or are a previous client please text or email. Availability is updated weekly. It can appear that I've no availbility for months... just check back (Wed/Thurs) if calendar says "no times available" ( This means there are no slots this week but next week is not up online yet..) . Always check office visits too if no home visits available. I travel for home visits in South Dublin (See map below). Areas outside this in South Dublin have an additional €10 travel fee - see list on booking form. I don't cover North Dublin for home visits. 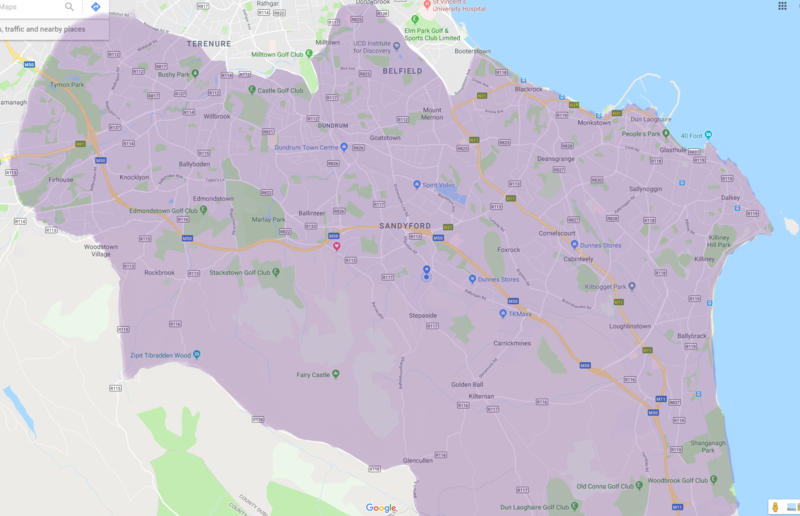 If you're outside all of these areas on the map or listed for extra travel fee - you could schedule an office visit at Evie in Beacon Court, Sandyford on Tuesdays. All antenatal consults and follow up visits occur at my office. These appointments can be scheduled up to 6 weeks in advance. Lactation Consult in your home. Help with your particular needs and goals. Includes a detailed health history, infant feeding assessment and plan of care . Also text/e-mail follow-up for two weeks after the visit. Select the travel fee when booking if you're in one of the neighborhoods listed above. Available times will be posted 1-2 weeks in advance so check again if nothing available. If you're outside my catchment area, I can see you in my office (Evie, Beacon Court, Sandyford). Learn about breastfeeding before your baby’s birth this is the way to do it! Whether it's your first baby or you had breastfeeding troubles before, coming to the class will build your confidence and you will no longer feel that breastfeeding is such a difficult thing to do. Everyone attending has the opportunity to ask questions during the class. You are welcome to attend at any stage in your pregnancy. booklet, gift bag, tea/coffee and bucket loads of encouragement! Partners welcome. Learn to breastfeed in a one-on-one setting that addresses your particular concerns and questions. Office only. Very useful if you have had a previous difficult experience breastfeeding . If you need continued in-person help, please book an office consult here. If you need continued in-person help, please book a home visit consult here. This service is for existing clients who would like to follow up by phone after their initial follow up period has passed. Please text/email me if no slots available and I'll add one to the calendar.